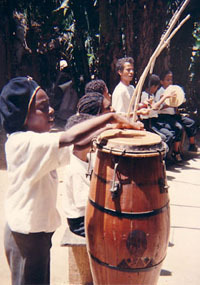 The Filhos de Angola Capoeira Group celebrates its 20th anniversary this year (2004). To have survived and prospered those 20 years is, to us, clear evidence of our serious efforts and our dedication to pass on the Capoeira Angola just the way it was bequeathed to us by our African forebearers and our grand masters. My biggest concern while working in Brazil was to teach the Brazilian children, to impart their true history to them by discussing the reality of childrens life in Brazil and by giving them an understanding of the historic, socio-economic and ethnic factors which explain their current situation; factors such as educational deficiencies and marginalization. In Europe, I endeavour to raise wareness of the preservation of Capoeira Angola amongst Capoeiristas and other admirers of this art in order to prevent Capoeira Angola from losing the connection with its original form. Since there are more and more groups of Capoeira Angola that, too often, are not taught by a Mestre, I endeavour to show that Capoeira should always be taught by an experienced Mestre, trained amongst Capoeiristas. A person who has only practiced Capoeira for two or three years will never be able to teach this art properly according to its rituals, the fundamental principles of the play, etc.. An extensive knowledge of Capoeira needs quite a lot of time to develop. Therefore, we try to prevent Capoeira being divided into separate parts, and to preserve it in its entirety. Ever since its foundation, the members of the group have been trying to pass on the teachings of a traditional Capoeira through the immediate contact between a Mestre and his students. The members have also been trying to trace back the origins of the traditional Capoeira by studying relevant sources and by starting an archive; and they show a great commitment in spreading Capoeira among the general public. estranged from the tradition that our old masters bequeathed to us. The fact is that, put kindly, we usually find Capoeira-players nowadays, and not true Capoeiristas, aware of the meaning and importance of the cultural background of this art. Very few genuine artists remain.